New York: Standard & Poor’s Ratings Services has lowered its credit ratings for many of the world’s largest financial institutions, including the biggest banks in the US Bank of America Corp. and its main subsidiaries are among the institutions whose ratings fell at least one notch Tuesday, along with Citigroup Inc., Goldman Sachs Group Inc., JPMorgan Chase & Co., Morgan Stanley and Wells Fargo & Co.
S&P said the changes in 37 financial companies’ ratings reflect the firm’s new criteria for banks, and they incorporate shifts in the industry and the role of governments and central banks worldwide. The agency did not release its evaluation of each company but said it plans to discuss the changes during a conference call early Wednesday. Bank of America’s issuer credit rating was cut to “A-" from “A," as were its Countrywide Financial Corp. and Merrill Lynch & Co. Inc. units, along with a series of related subsidiaries. 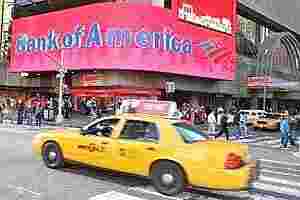 Ratings downgrades are never seen as positive, but this round may be particularly damaging for Bank of America. Concern already was growing Tuesday about whether B of A has enough capital to withstand another downturn in the US economy or further trouble in Europe, and the bank’s stock fell to a two-year low before the ratings announcement. Downgrades could hurt parts of the bank’s businesses where creditworthiness is critical, Bank of America said in a filing on 3 November with the Securities and Exchange Commission. A downgrade also could trigger provisions in derivative contracts that require B of A to put up more collateral, and it could terminate the contracts, resulting in losses and hurting the bank’s liquidity. The bank posted a $6.2 billion profit for the third quarter, mostly the result of accounting gains and the sale of a stake in a Chinese bank, but it was still moving toward a loss for the year as of 30 September. Bank of America shares fell 17 cents, or 3.2%, to close Tuesday at $5.08 and lost another penny after hours. S&P cut its rating on Citigroup Inc.’s credit to “A-" from “A’’; a series of its subsidiaries also saw changes. Citigroup shares closed up 19 cents, at $25.24, and lost 14 cents aftermarket. Goldman Sachs also was cut to “A-" from “A," which triggered some downgrades for subsidiaries. The investment bank’s shares closed regular trading down $1.62, at $88.81, and lost another 12 cents in late trading. JPMorgan Chase’s rating also dropped to “A’’ from “A+," and its Chase Bank unit was downgraded to “A+" from “AA-" and other subsidiaries ratings also changed. JPMorgan Chase took the place of Bank of America as the nation’s largest bank in recent months. The bank’s stock lost 6 cents aftermarket after closing the regular session down 60 cents, or 2%, at $28.56. Morgan Stanley’s rating slipped to “A-" from “A’’ and several of its units also got cut one notch. Shares slipped 9 cents in late trading from their close down 49 cents, or 3.6%, at $13.31. Wells Fargo fell to “A+" from “AA-" which likewise triggered downgrades for several subsidiaries. Shares closed down 7 cents at $24.08, then lost 18 cents aftermarket. In addition, Bank of New York Mellon Corp., the sixth biggest bank in the US, was cut to “A+" from “AA-," and some units were downgraded. Bank of New York Mellon is a custodian bank, which collects dividends on stocks and holds cash deposits, among other things, on behalf of its customers, which are mainly large pension funds and money market funds. The stock closed down a penny at $18.08, then lost 8 cents in late trading. Top UK downgrades include Barclays PLC, HSBC Holdings PLC, Lloyds Banking Group PLC and The Royal Bank of Scotland. Ratings for several big European banks, including Credit Suisse, Deutsche Bank, ING Groep N.V. and Societe Generale were unchanged, but in some cases they were given a “negative" outlook.